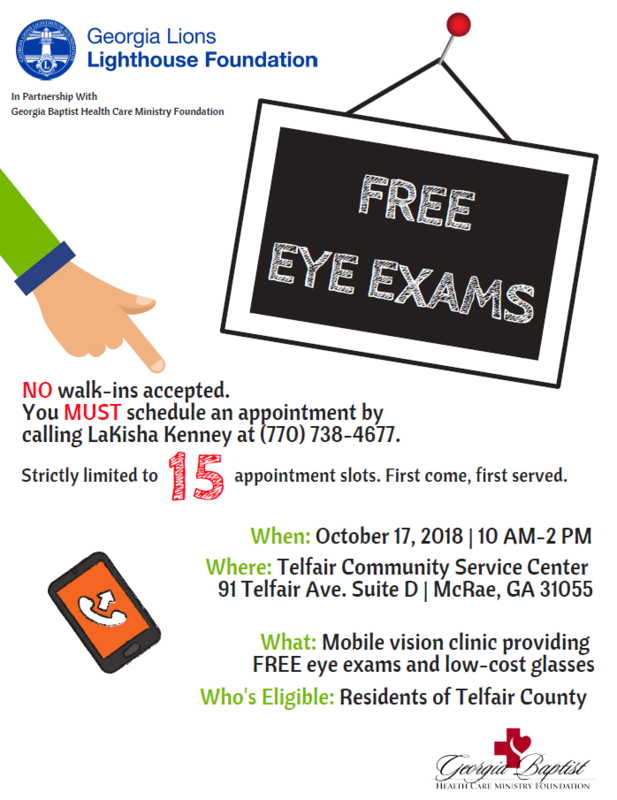 The Lighthouse vision team will be in McRae on Wednesday, Oct. 17, for our next Georgia Baptist Health Care Ministry Foundation-sponsored clinic. As you may remember from earlier posts, GBHCMF has very generously provided the funding for The Lighthouse to visit – for the first time – many of the state’s most rural and underserved areas. Already we’ve been to Griffin (Spalding County), Millen (Jenkins County), and Elberton (Elbert County) and are so excited to keep going! Are you in Telfair County? Need an eye exam? Check out the flyer! We’ll be at the Telfair County Community Service Center, 91 Telfair Ave., Suite D, and are looking forward to serving you!